As a responsible gun owner, you know secure storage of your gun(s), whether required by law in your state or not, is a must. Buying a best gun safe can be a confusing process. Hundreds of products have been created to meet hundreds of differing needs. 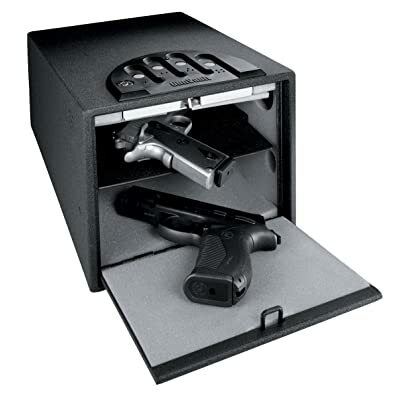 To help you choose, I’ve gathered 10 of the top rated gun safes on the market. Each meeting differing needs, for reviews and comparison. Is the main purpose to prevent theft or to keep the weapon(s) away from the curious hands of children, neighbors, or customers? Do you need to safely store the gun (or guns) away from determined burglars, or sneak thieves? Do you want quick and easy access in the event of an emergency? Is it for handguns or long guns? Where will it be kept . . .home, office, car or hidden? Will anything else be stored with the guns? Do you need fireproof and waterproof gun safe for your guns? Additionally, there are several “sub-questions.” For example, when thinking of who you want to prevent gaining access to your guns remember that even a sneak-thief could carry a small gun safe away to be opened later. So what mounting options do you need? If you think you need to prevent burglars with a pre-determined plan, power-tools, and time, obviously the necessary strength of construction would be greater than that needed to deter sneak-thieves. If you intend keeping your guns close to you for emergencies, say in your car, you would need to consider portability. And obviously, if you own rifles or other long guns, a tall gun cabinet or safe is required. This does not detract from the quality of their construction in relation to their purpose. They all meet the requirements of most states for the storage of firearms (you should always check local legislation), but it does mean that they are not fire-rated or burglary-rated. It is also worth noting that every electronic product here has some reports of keypad, biometric, or battery failure associated with them. However, compared to the number sold these complaints are relatively few and seem to be associated with the evolving technology rather than a particular model or manufacturer. Let’s take a look at the list of top 10 best gun safes 2017. 13 " x 6.5 " x 3.5 "
2.2" x 6.6 " x 9.7 "
5.04" x 11.42 " x 14.76 "
13.5" x 32" x 55.1"
60" x 34" x 26"
To store a single gun out of sight while keeping it close at hand, the SV500 could be the answer. The sheer variety of mounting options its innovative design offers means this is possibly the most versatile unit on our list. The 18-gauge steel exterior and high-strength electronic lock will deter all but the most well-prepared intruders, and still offer you lightning-fast access. Enter your personal code via the 4-button digital keypad, the foam-padded drawer drops open, an internal light comes on in case it is dark, and your handgun is presented grip first and ready to draw. Other alarms and warning lights include a low battery warning, and a light will flash and a beep will sound when a button is pushed. These can be muted if you prefer. The electronic keypad and lock need a 9-volt battery, and if, for any reason, the keypad does not work you can still reach your gun with the supplied override keys. A 1-year limited warranty is also included. If you want a secure, affordable, and adaptable solution for securing a single gun in your home or your business, then this may be the one for you. 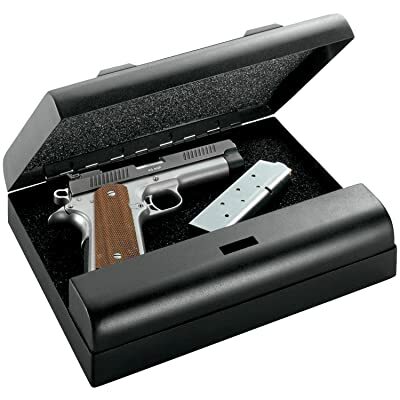 Looking to store a single handgun but want to conceal it in a drawer? If yes, then this safe may be a better option than the SV500. What this top-opening model loses in versatility, it makes up for in security. 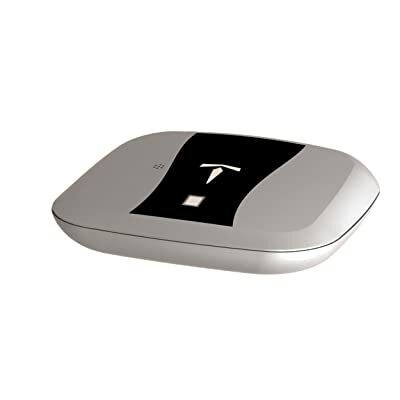 Sturdier than the previously discussed product, the locking mechanism can be disengaged in three ways: biometric fingerprint reader; 4-button electronic keypad; or override key. For extra security, this safe can even be programmed to require an authorized fingerprint AND a push-button combination for entry. A secondary fingerprint can also be stored in case access is needed when you are not present. Touching the fingerprint reader or a button activates an LED backlight to assist you in the dark, but there is no audible sound. Combined with a gas-assisted strut silently opening the lid for one-handed access to your pistol, your presence will not be revealed to intruders. Unlike the next safe, the fingerprint reader, the buttons, and the lock are all located on the top of the safe. This means that, by using the pre-drilled holes in the bottom of the safe along with the included hardware, you can anchor this product inside a drawer to prevent sneak thieves carrying it off, without blocking any of the entry methods. Alternatively, if concealment is not a concern, the unit could also be anchored to any horizontal structure such as a shelf, the top of a night stand, or even the floor. 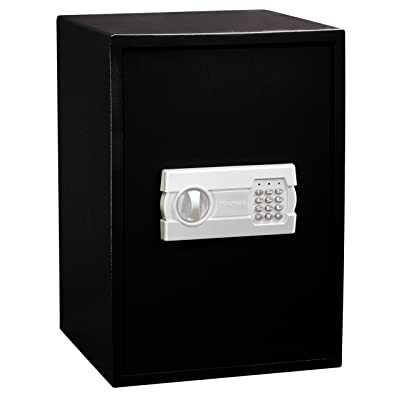 This safe is slightly more expensive than the SV500, but less expensive than some products that follow, so if you are looking to balance budget and security this is certainly worth consideration. Four AA batteries, not supplied, are needed for the electronic components, but a 1-year limited manufacturer’s warranty is included in the sale price. The MV5000-STD is another top-opening safe intended to store a single hand-gun. It makes the list as a viable and cheaper alternative to the previous product by Sentry Safe. Like the previous safe, you could anchor the Microvault inside a drawer. If you do this, however, the override keyhole which is located on the front of the unit may be difficult to reach if the electronic keypad fails. There is one distinct difference between this and the previously mentioned safes, a difference that may be of immense importance to you: this safe is designed to be portable! This portability is achieved by using slightly thinner steel than on the Sentry Safe model (although it is slightly thicker than on the first safe we discussed). This makes it light enough to carry comfortably, and it comes with a steel security cable you can use to secure it to a seat in your car. The electronic keypad on top of the unit has four buttons and Gunvault’s proprietary “no-eyes” molding around the buttons. This molding helps you position your fingers correctly so that you can accurately enter your code even in the dark. And, as with the SpeedVault, there are over 12 million possible codes. 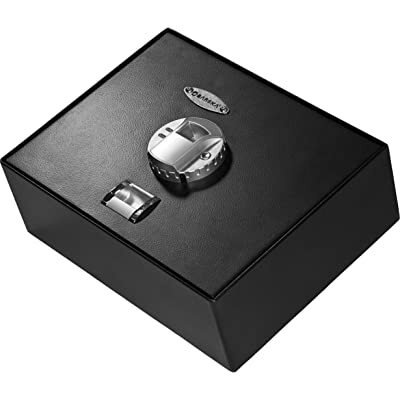 Other features are also common to most safes produced by GunVault. For example, LED lights and audible beeps let you know when a button has been pressed correctly and if the 9-volt battery required for the electronic keypad is running low. If you prefer, the sounds can be disabled for a stealthier entry. Additionally, the keypad will block access if repeated invalid keypad entries are made. If you need to secure something more than a single handgun, then this is the first product listed here that will meet your needs. Although still not tall enough for long guns it can easily house multiple handguns and accessories along with other valuables. The PS-1520 comes with two removable shelves, allowing you to change the internal layout to suit your needs, and the shelves and the bottom of the safe are foam-padded to protect your guns and valuables from damage. It looks more like a traditional safe, but as with the other models here, it does not hold a fire or burglary rating. The sturdy construction with a pry-resistant door, internal hinges, and two steel locking-bolts will resist unplanned attempts to open it, but even though it’s 45 lbs. and somewhat bulky, it could be carried away. To prevent this, the PS-1520 comes with sufficient hardware so you can easily secure it to a wall or the floor. As with most products of this type nowadays, the locking mechanism is opened using an electronic keypad (which does have a silent mode) and, in case of failure, a back-up key is provided. The instructions for programming your personal code (which can be anything from 3-8 digits) are clear and simple to follow, and the keyhole for the back-up key is concealed behind the keypad. You could keep this safe at your bedside, but because of its size you may want to keep it in a closet, or possibly under a desk. For this reason, although relatively quick entry access is possible, the safe may physically be farther away from you than other models would be in an emergency. Unlike most of the safes discussed so far, this model comes with a 3-year limited warranty rather than just 1-year. This product from GunVault is another multiple-handgun option, but it is smaller than the Stack-On and will probably only hold two pistols with a few accessories. It makes the list, however, as a great compromise: it offers you the convenience of keeping it nearby that single-gun safes offer—it could easily be secured to the top of, or inside, a nightstand—combined with the ability to hold more than one gun. The door is on the front and, although the unit is light enough at 14 lbs. to be carried, it is designed to be fixed to a shelf, cabinet, or the floor rather than to be portable. Made from 16-gauge steel and designed to offer no opportunity to insert prying instruments, this safe will resist most sneak thieves. And the 4-button electronic keypad (requiring one 9-volt battery – not included) with over 12 million possible combinations will give you peace of mind by denying access to the most curious of children or other people while allowing you easy and lightning-fast access. The keypad also features GunVault’s proprietary “no-eyes” molding around the buttons so that you can position your fingers correctly and enter your code without being able to see the keypad. 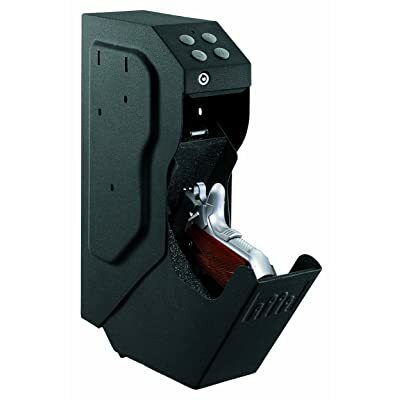 The override key backup, audible and LED feedback when pressing buttons, and low battery and tamper warning that are standard with GunVault products are, as expected, also present here. 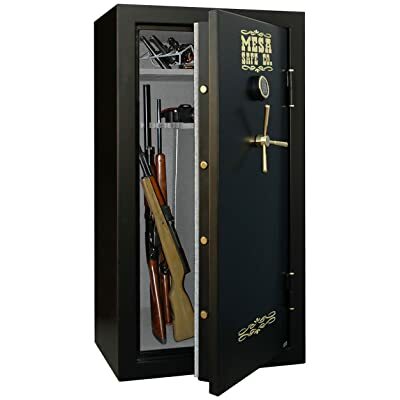 This safe is affordable and convenient if a smaller, multi-gun safe is what you are looking for. This is the third of our choices that can be stored in a drawer, although the pre-drilled holes in the bottom and the included hardware would allow it to be equally easily fixed on a shelf, nightstand, or some similar, less-easily moved object. It is also our third choice that can hold more than one handgun. Here, unlike on the Sentry Safe biometric model discussed earlier, the keypad has been discarded completely. The motorized lock and two steel deadbolts are opened with the swipe of a finger, and the fingerprint reader has enough memory to store 30 different fingerprints in case you want to authorize others access to your guns and valuables or to store the print of more than one of your own fingers. This safe is large enough to easily hold more than one handgun along with other valuables. 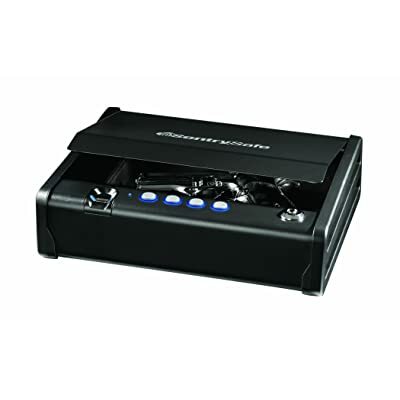 Compared to the other options designed for concealment in a drawer, it is larger than the Sentry Safe model, and it has the easier access of a fingerprint reader that the Gunvault model lacks. One downside to this product is that biometrics is still a relatively new technology and, if for some reason the fingerprint reader fails, to access the keyhole for the supplied backup keys you have to remove a metal plate using an Allen wrench. Not ideal if you are in an emergency situation and needing quick access. The manufacturer does offer a 1-year limited warranty, and four AA batteries are required for the fingerprint reader. Fort Knox, perhaps best known for full-size and custom made vaults, turned their attention to making a secure pistol safe and the result is the PB1, probably the most secure pistol safe available. 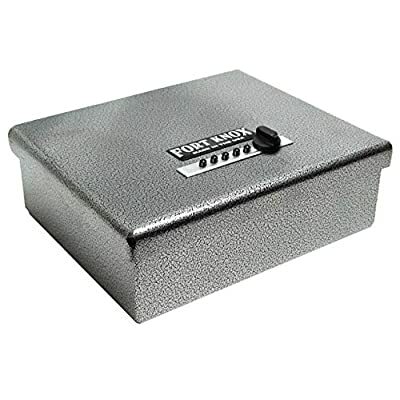 Made from 10-gauge steel and with a top-opening lid that is 3/16” thick and wraps around completely to prevent the insertion of prying tools, your average thief, and (perhaps many of your above-average thieves) are not going to get into this safe! Yet, despite this solid construction, once unlocked you are going to have no problem opening the lid because of the gas-assisted struts helping you. Large enough to hold two handguns plus accessories and some other valuables, it is still small enough to fit in a drawer if hiding it from sight is preferred. Perhaps the only downside is that this safe is not really designed to be portable. Having said that though, despite its solid construction, this safe is only 21lbs and could be carried off. But it is pre-drilled and can be easily secured in your location of choice. The potential for electronics failure is avoided by simply not having any. The push-button and turn-knob “Simplex” entry system is mechanical rather than electronic and is therefore immune to the battery or technology failures noted in other safes. Add to this a lifetime manufacturer’s warranty and this safe easily becomes our number 1 choice. It may not have any bells and whistles like biometrics or electronics or LED lighting, but as long as you are not looking to store long guns this is the best gun safe for money when considering strength of construction and versatility! From a basic we-dare-you-to-get-into-this type of safe, we move to the other extreme. If, in addition to being a gun owner, you are a bit geeky, then this is the safe for you. For the model reviewed here, it is pricey compared to the other single-handgun options, but is included in this list because it represents the cutting-edge in gun safe technology. The basic version uses radio frequency identification technology via the provided wristband and sticker to control entry. The version reviewed here uses either the RFID technology, or a biometric fingerprint scanner, or a combination of both, and the premier version adds GPS monitoring and tracking in case your safe is stolen. The other safes so far have been made from steel, but this unit is made from aircraft strength aluminum alloy. It will hold one handgun plus some accessories, and is extremely portable–it is FAA approved for transporting your gun in checked luggage. It is also designed to be mounted in a variety of orientations without restricting access. As with many electronic devices, however, the profit for the manufacturer lies in the accessories: If you want to use an RFID ring instead of the supplied wristband, you must buy it separately. And if you want to secure the safe in your car—a purpose for which this safe would seem to be ideally suited–you must buy the car adapter, the lock port, and the cable separately; etc. Reports from owners show two main patterns: A lot of the technology is new and therefore may be a bit unreliable until all the kinks are worked out, and this seems to be a love-it or hate-it product with little in between. But the choice to buy has to be yours. Does the risk of technology failure outweigh the possibility of owning something really special? Now we come to the first of our two products designed for the storage of longer guns. This cabinet is exactly what it claims to be: a security cabinet rather than an actual safe. The welded steel construction of the cabinet is not flimsy and would repel most intruders-of-chance, but you might want to consider the number of complaints by previous owners regarding damage sustained during delivery. This may cause you some concern regarding the cabinet’s resistance to a determined or pre-planned attack. There are two separately-keyed doors using double-bitted keys that activate an all-steel locking system that locks each door at 3 different points. One door gives you access to a 19.5-inch-wide gun section that can hold 10 rifles or shotguns if they are less than 54 inches long. The other door opens on a separate 12.5-inch section with removable shelves. 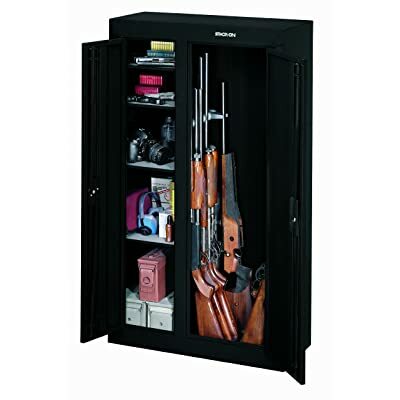 In this section you can store accessories, ammunition, handguns, and other valuables, or you could remove the four padded shelves to store more long guns. The ability to configure this cabinet to your own needs makes it very versatile, and no matter how you configure it there is plenty of room for any kind of dehumidifier that you might want to use to protect the contents from damage caused by moisture. Hardware is included for securely fixing the cabinet to the floor or to a wall and this is definitely something that should be taken advantage of. Although the cabinet is large, its weight of 111lbs means that, if not secured, it is movable. Access is not going to be speedy in an emergency situation, but the rifles will be relatively safe from most intruders. Of all the products reviewed here, this is the only one that can be thought of a “safe” in the traditional sense of the word. It is also the only product here that is fire-rated, having been tested at up to 17500 F for 1 hour. This is a safe for the really serious gun owner, perhaps a collector, or for someone with really serious security issues. Made from steel that is one and a half inches thick and standing 5-feet tall, this safe weighs over 650lbs. Without hauling equipment, you are probably not moving it once it is in place, but there are anchor holes to allow further securing to the floor. All walls, shelves that are removable and adjustable to allow varying configurations, and the inside of the door are carpeted or upholstered to prevent damage to anything stored within the 14.4 cubic feet of space. 20 rifles will fit easily in here. Multiple solid steel locking bolts, each one inch in diameter, are controlled by a battery-operated, electronic keypad (a backup key is provided), and drill-resistant plates protect the locking mechanism. The manufacturers claim that this safe will withstand a fall from two stories up, and from the look of the construction there is no reason to doubt this. So, there you have 10 choices of gun safe. Something for everyone and at every price point. Which one would suit your needs best? that is my top-10 list of gun safes. In our opinion, for most of us, the Fort Knox safe would clearly be the winner due to its combination of strength and versatility when compared to price. It is not the cheapest but is the best value gun safe for money. If you are on a restricted budget however and can’t reach the cost of the Fort Knox, you could consider the MicroVault or the PS-1520. They would serve to secure your guns safely in most household situations and, in our opinion, the choice would rest simply on whether you wanted to store one or more guns.